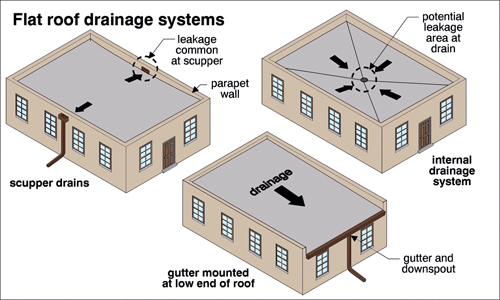 What is the minimum drainage fall for a single ply flat roof? Home Blog What is the minimum drainage fall for a single ply flat roof? The recommended minimum fall for a flat roof is 1:80 (0.72⁰). This applies whether the waterproofing is a polymeric single ply membrane, a reinforced bitumen membrane, or another type listed in BS 6229:2018, the code of practice for flat roofs with continuously supported flexible waterproof coverings. To achieve a 1:80 fall, the code of practice says that the roof should be designed for a fall of 1:40 (1.44⁰), to account for construction tolerances, deviation in the roof deck and material deflection. As well as the general roof area, any internal gutters should be designed to the same criteria. Is a zero falls flat roof ever acceptable? Some flat roofing systems, where the waterproofing and thermal insulation are assessed together, have third-party certification to say that zero falls is acceptable. However, back falls are not acceptable and should be avoided so as not to cause ponding and place undue stresses on the roof structure. Where a certified system is used and zero falls roof is intended, a design fall of 1:80 should be allowed for. Read more about what to consider in flat roof design, or contact us with any drainage falls questions by filling out our enquiry form.